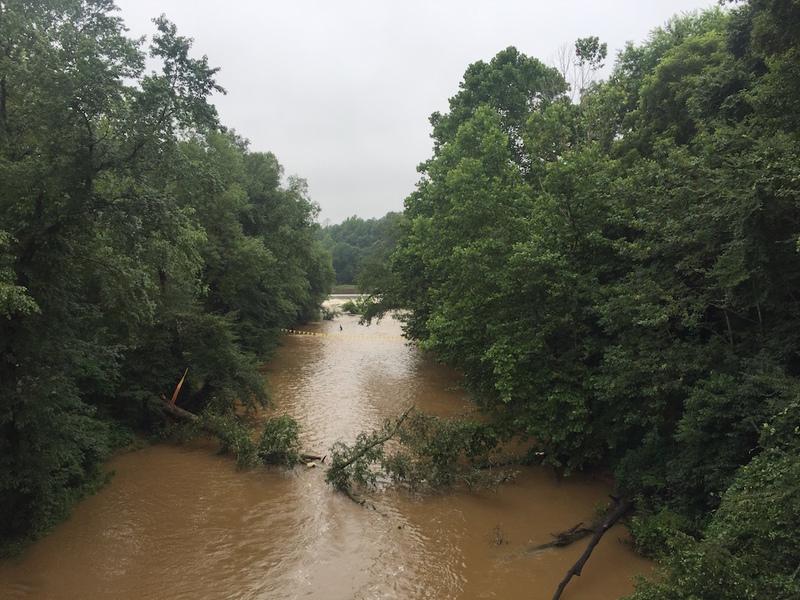 North Carolina’s Eno River, festival host and tar heel water source. Rain would be a downer on any other parade. But at the Festival for the Eno, it fits right in. In fact, Mother Nature seemed a welcome guest at this year’s July 4th event. The Senegalese performers still led dances, children’s faces were still painted, park rangers still patrolled with interactive games on invasive species, and the river still flowed, even stronger than before. For this Durham, NC festival is no normal July 4th celebration. Sure, there’s food and drinks and music. But there’s also a booth on the benefits of mindful eating, local artisan stands, and a form of juggling that looks more like small-ball-levitation. While the rest of America pays tribute to our country, the Festival for the Eno, now in its 37th year, celebrates the land. I attended the 2-day festival on its second day, Monday, July 4th. Over the course of the weekend, around 20,000 others, including many children, toured the local art and music with craft beer or a smoothie-filled pineapple in hand. Four stages, separated by craft booths and craft beer, entertained attendees with folk and world music. The clip below is from Diali Cissokho & Kaira Ba’s performance. Artisans included jewelry makers and sand art sculptors. There’s also a small hive of beekeepers, doling out honey samples. One Fayetteville beekeeper we spoke to, Rodney Medley, said his first interest in the field was a result of his visit to the 2014 festival. Two years ago, he was on the other side of the hive, with a strong interest in biology. Now he’s tending his own honeycombs. A sculpture of sand and frogs. But the fest’s environmental theme is bigger than its booths. 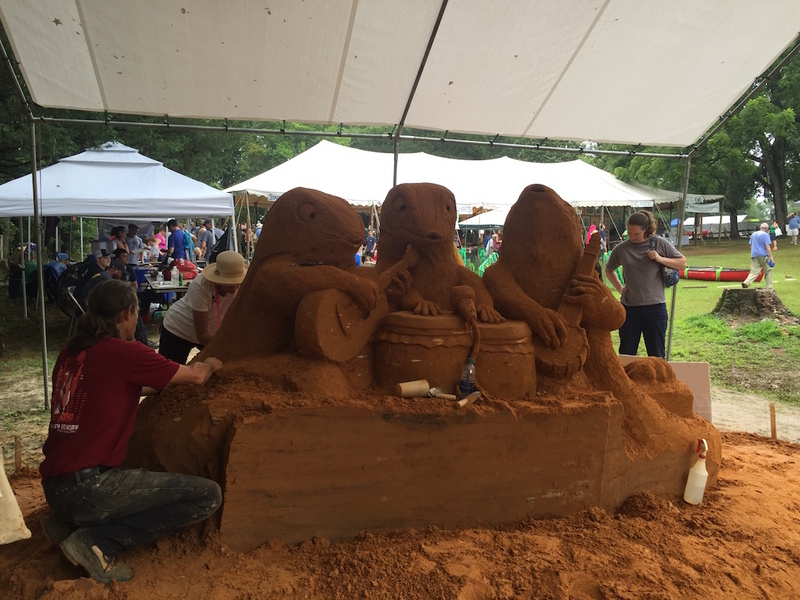 The Eno Fest enables trash-free fun with their ambitious compost and recycling program. More than 40% of the festival’s waste is composted, and more than 50% is recycled, meaning that 97% of the festival’s waste does not end up in local landfills. I composted my pineapple husk, along with its straw, fork and napkins, meaning my muddy flipflop footprint left more of a mark than my food consumption at the fest. The Eno Fest isn’t your typical Independence Day celebration. I saw more green than red, white and blue. But its melting pot of artists and its thanksgiving to a significant North Carolina waterway, make the Eno Festival a very American event.